European Union President Donald Tusk took a swipe at U.K. politicians who campaigned for Brexit without an idea of how to make it happen "safely." A day before Prime Minister Theresa May -- who is trying to chart a course that satisfies pro-Brexit hardliners in her party -- is due in Brussels for talks, Tusk slammed those who made campaign promises that made the divorce seem easy. “I’ve been wondering what that special place in hell looks like, for those who promoted Brexit, without even a sketch of a plan how to carry it out safely,” he said at a press conference in Brussels with Irish Prime Minister Leo Varadkar. It wasn’t a gaffe: He tweeted it too. 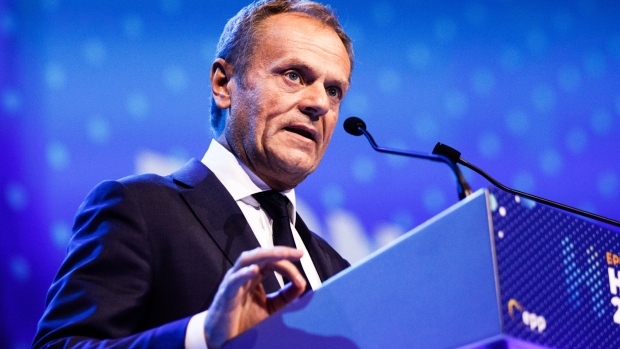 Tusk, a former Polish prime minister who openly regrets the U.K.’s decision, seemed to be targeting the politicians who led the pro-Brexit campaigns in 2016, such as former Foreign Secretary Boris Johnson and Nigel Farage, the ex-leader of the U.K. Independence Party. At the end of the press conference as Tusk and Varadkar shook hands, microphones picked up the Irish premier telling him: “They will give you terrible trouble in the British press for this.” He laughed and nodded. It didn’t take long for British and Northern Irish politicians to react. "Conciliatory as ever, isn’t he?" Former Brexit Secretary David Davis said with a laugh. With less than two months before the U.K. is scheduled to leave the EU, Tusk, who has an Irish speechwriter, said the priority is now to prevent a no-deal Brexit. He also seemed at last to be coming to terms with Brexit, saying it’s time to acknowledge there’s "no effective leadership for Remain."